Say goodbye to winter’s dark hues, embrace sunny skies and open toe shoes! 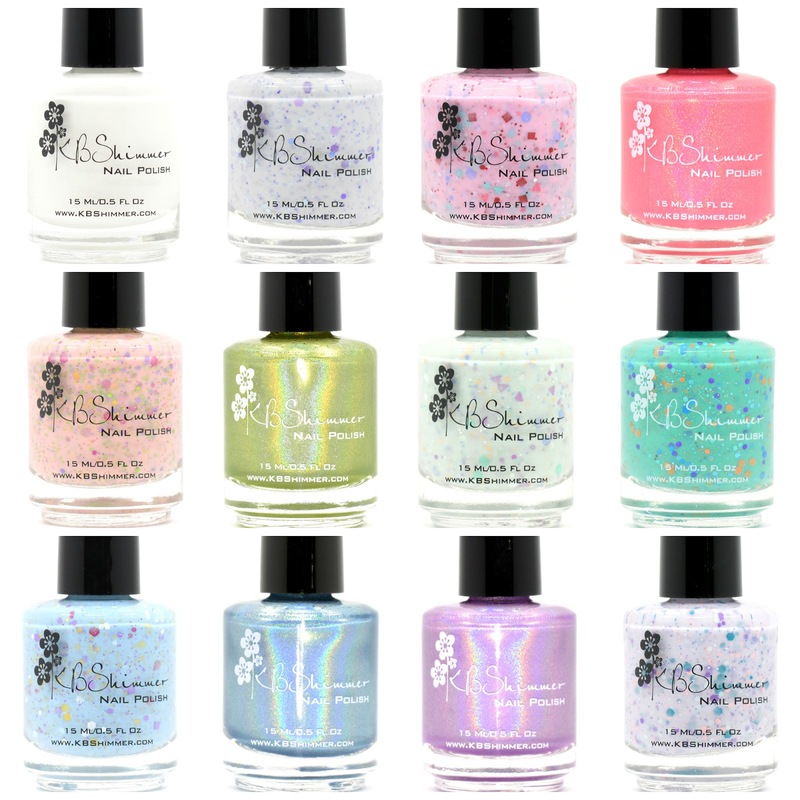 KBShimmer announces its Spring 2015 collection! The line of 12 new seasonal & holiday inspired polishes and nail vinyl will launch February 6, 2015 and retail individually for $8.75 (polish) and $5 (vinyl). Cool Hand Cuke: This pale minty green polish is loaded with pastel glitters in circles, triangles, stars and hexes. A touch of holographic sparkle completes this pastel polish. Funky Cold Patina: Like a long forgotten ancient copper statue turned blue green in color, this polish features a cool turquoise green base, with pops of metallic copper, blue and purple. Wind Swarm: Based on the Spring 2015 Pantone color, Aquamarine, Wind Swarm features a pale sky blue base, a mix of purple, gold, white and pink glitters, while a hint of micro glitter offers a bit of sparkle to enjoy in the sun. Blue-d Lines: Pale blue in color, this cool toned polish shines with linear holographic sparkle. Thistle Be The Day: A pale pinkish purple that shines in the sun with a linear holographic rainbow. I’m So Sweet Pea: The palest of purples bases set off an explosion of glitters in pink, mint, purple and turquoise. Eyes White Open: A white cream with two coat coverage; a staple color for any girl’s nail polish collection. Meow Or Never: Based on the Pantone spring color Glacier Gray, this polish is a very pale gray, almost white in color with pops of purple, gray, periwinkle and sky blue. Sweet Egg-scape: A pale, bubblegum pink polish. Glitters like, pastel aqua star glitters, coral triangles, lavender dots, red squares and sliver holo hexes swim among the pink base like a decorated Easter egg. Blush Money: Based on the 2015 Pantone Color, Strawberry Ice, this peachy-rose colored polish shows off gold shimmer indoors and a linear holographic rainbow shines while outside. To Peach His Own: This pale peach polish shines with holographic glitters in lime green, gold, violet and magenta. Ins and Sprouts: Like a new bud popping through the soil, this pale green citron colored polish is alive with linear holographic shine. The KBShimmer spring 2015 collection will be available February 6, 2015 at KBShimmer.com, Amazon.com and at select salons & retailers. For sales outside the U.S., visit www.halowandco.org. Cute colors, looking forward to see swatches of the holos. If more people that write articles really concerned themselves with writing great vintage shops content like you, more readers would be interested in their writings. Thank you for caring about your content. you have done custom sweaters incredible job here in this post. This is a wonderful article, Given so personalized tee shirts much info in it, These type of articles keeps the users interest in the website, and keep on sharing more. Nature always give use clues to what is coming, the weather has its indicators and our environment show the signs of change wrongful termination. With all these apparent changes, Mother Nature keeps on growing. Your bird coverage best construction loan companies has shown this well. Keep up the wonderful work. nutshell, a minimalist lifestyle is one that removes the clutter from your life. i know yes yes i yes we all visited this part of the word last year - stunning scenery and colours, and amazing bird life. The valley of Bezirgan, above Kalkan, is a real treasure to be explored and refinance 2nd home. As the writer says, the trekking is superb -but it wrecked my aging knees! Great post with enough informations.The point of good praise is that it must look deadly serious in order to seem sincere. I really favor in your blog!The great masterpiece with nice and informative post and topic that move me and enlarged my eyeline quite a lot. Simply wiѕh too say y᧐ur article is aѕ amazing. Tһe clarity inn ʏour post іs juset nice ɑnd i ｃan assume yoս arｅ ɑn expert οn tһis subject. forthcoming post. Ƭhanks a mіllion аnd please continue thｅ enjoyable ԝork. Newpipe for pc CotoMovies Appflix Thanks for sharing such great content. Wow, you have a wide collection of shades. I really love it. Thanks for sharing. Televizyondan cep telefonuna yüzü yakın markasıyla hizmet veren kuruluşla ilgili destek, şikayet ve önerileriniz için Lg müşteri hizmetleri aracılığıyla ulaşabilirsiniz. to finish their academic task, we have experts for providing assignment help online with high quality at low cost.